Composition : Foly Tablet : Each tablet contains Folinic Acid 15mg as Calcium Folinate Pentahydrate BP. Indications : It is indicated to diminish the toxicity and counteract the effect of impaired Methotrexate elimination, treat the Megaloblastic anemia due to folate deficiency, as in sprue, nutritional deficiency & treatment of the Megaloblastic anemia of pregnancy and infancy. 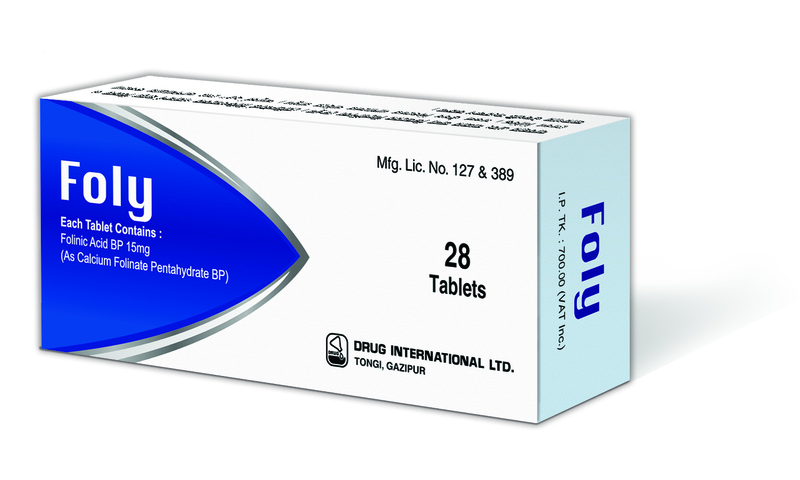 Dosage and administration : Foly Tablet: Reduction of harmful effects of folic acid antagonists such as. Methotrexate, Trimethoprime etc. The dose is usually one 15mg tablet every 6 hours for 2 to 3 days. For megaloblastic anemia in the treatment of Megaloblastic anemia, the dose is one 15mg tablet daily. Packing : Foly Tablet : Each box contains 2 x 14's tablets in blister pack.